Everything I've learnt about boarding schools were from the well thumbed pages of Enid Blyton's 'Mallory Towers' and 'St Clare's'. 'Prep'...'lacrosse'...'tuck'... these exotic words meant very little. Our school dinner puddings would involve, largely, semolina. Or on a special occasion, Jam Roly Poly with that peculiar school-dinner-issue thick custard that always left a trail of custard-skin on the spoon. Custard-skin that would be carefully, with almost surgical precision, be extracted and discarded. It seemed pupils at boarding schools had way nicer puds. Take Eton for example. They've an entire, classic, delicious, summery dessert named after the College. Traditionally served at the annual cricket match against Harrow School, Eton Mess is a marvellous mix of strawberries, meringue and cream. Not a semolina rice in sight. Nigella adds pomegranate juice to her version. Heston makes his with bananas. Me? 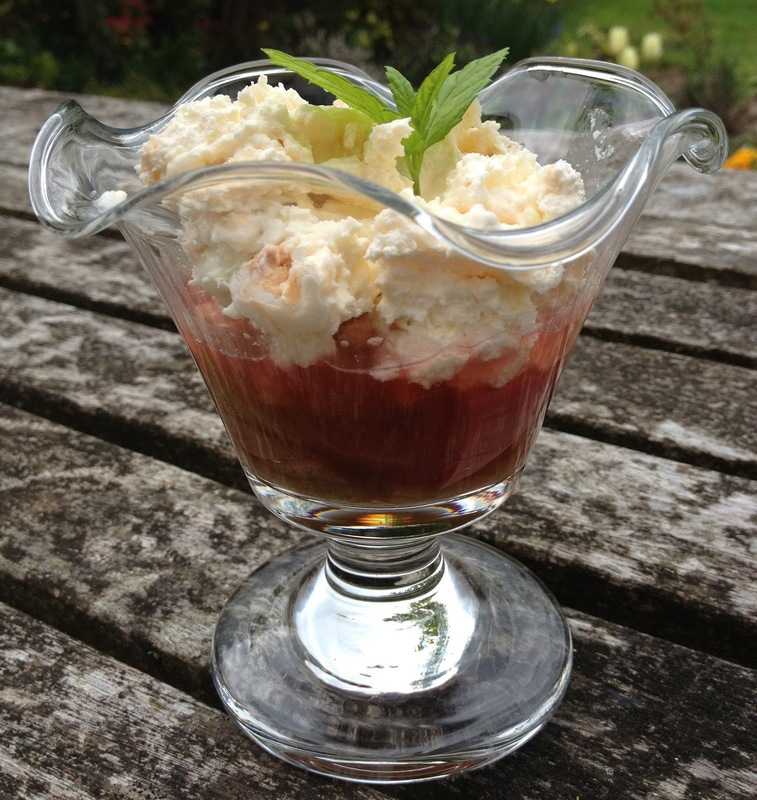 I've made a roasted rhubarb Eton Mess. Lovely. 2. 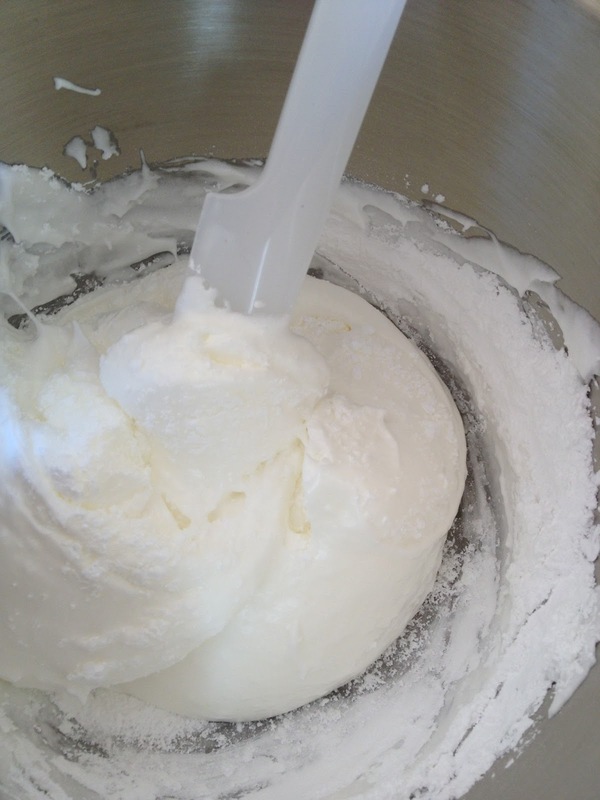 Beat the egg whites on a medium speed until the egg whites become cloud-like and foamy and the stiff peak stage is reached. Turn up the mixer speed and gradually add the caster sugar, a spoonful at a time, beating between each addition. The mixture will be thick and glossy when all the caster sugar has been added. 4. 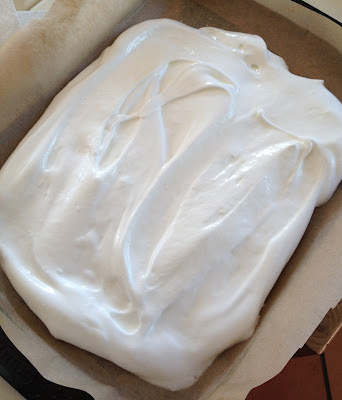 Gently spoon the meringue onto the prepared baking sheet and bake for 1 hr 15 minutes to 1 hr 45 minutes until the meringues are coffee coloured and they sound crisp when tapped underneath. Turn off the oven and leave the meringues inside, undisturbed, until the oven is completely cold. Set the meringue aside. There are three great things about Eton Mess. Firstly, it's delicious. Secondly, it's ever so easy to make. And thirdly, there's no worrying about fancy presentation. Pop it in a nice glass and decorate with a sprig of mint. Haha, I too got carried away by the food stories of boarding school antics from Enyd Blyton. How disappointed was I to find when I actually went to boarding school that the food was just as horrid as it had been at primary school - thick custard and lumpy semolina. If only we could have had some of your rhubarb Eton mess which sounds super delicious. I used to love Mallory Towers! 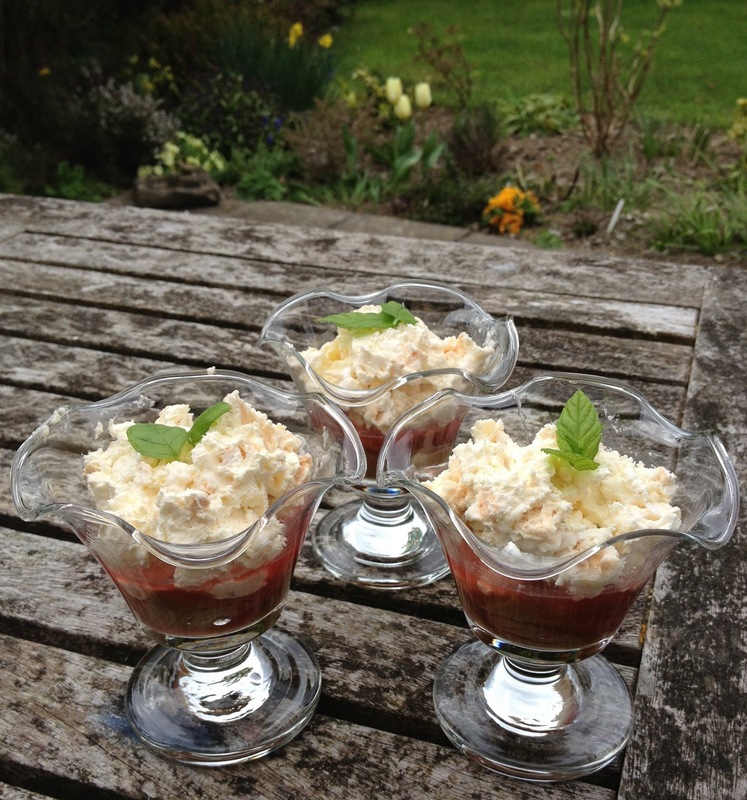 Eton mess is always lovely - and your pretty presentation makes it even nicer! Wowo looks delicious. I love rhubarb and need to cook with it more! Another Mallory Towers fan here and The Naughtiest Girl in the school! Love your take on Eton Mess, I've pinned it on the Rhubarb Board, I become slightly obsessed with rhubarb at this time of year. I was a school dinner cook back in the 80s and I always tried very hard to beat out any lumps as I hated school dinners when I was a child. 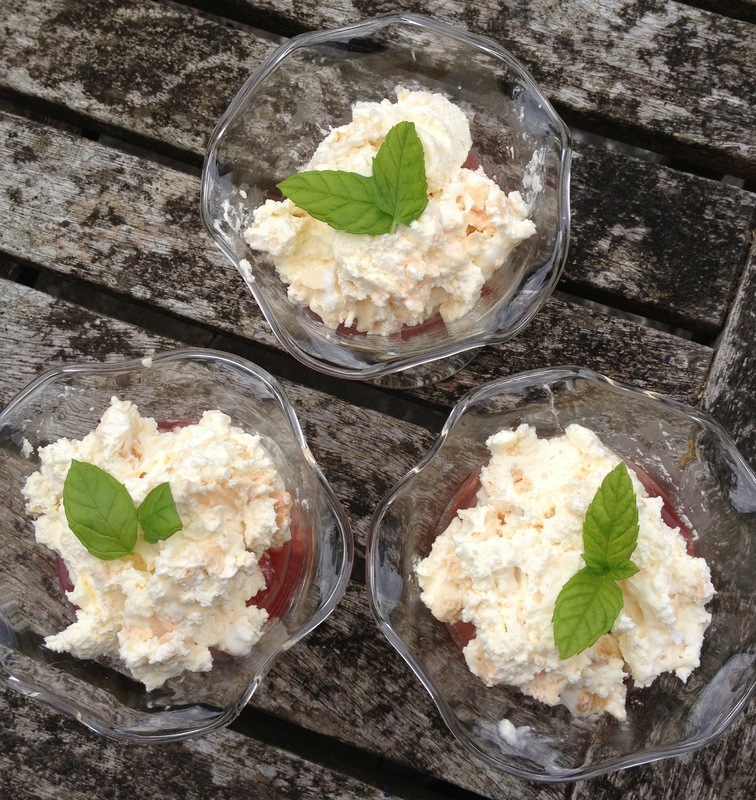 There was never eton mess in sight when I was cooking either! This is just the perfect combination of tartiness and sweetness. One of my favourites. 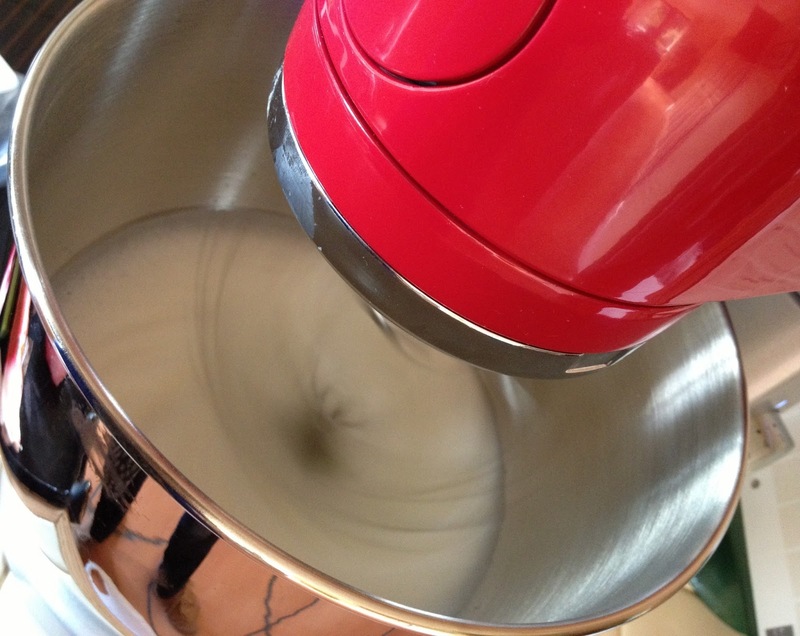 Hi Kate, I discovered your blog via the ´World Baking Day´site. This recipe looks extremely interesting.. since we dont have much rhubarbs here in Spain I hardly ever cook with it but it´s something I´ve always wanted to try to cook with..
Greetings,you´ve secured a new follower! i love rhubarb, and i'm cursed with an under-performing rhubarb plant! great idea. yum! Giveaway! Belvoir Fruit Farms Hamper!